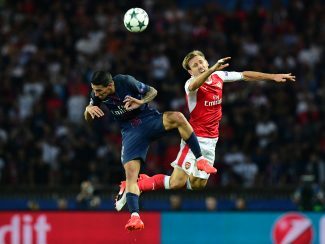 Game is what awaits us at the Emirates Stadium in London when the leaders of Group A of the UEFA Champions League, such as Arsenal and PSG come out to decide who will take first place. In direct matches, the numbers favor the English, who in three games are unbeaten with a win and two draws, and the numbers against French teams is also positive, having won 13 games for 3 defeats. Both teams are leaders with 10 points, but Arsenal takes the first place by having a better goal difference, the timing of both is also very good; Well, those led by Arsene Wenger comes from tying a goal in his visit to Manchester United and thus lengthened the streak of undefeated to 16 games in all competitions, this has come to remain in the top of the Premier League England, where he is third to two points behind leaders Liverpool and Manchester City. For their part, those led by Emery also a few are meeting again with their level, the Parisian team comes from winning 2-0 at Nantes adding not only his fourth consecutive victory, but his party 10 without knowing defeats, to The Parisians things did not start well after the change of coach, but a few have realized that not everything was Zlatan and thus have started to win, which keep it in third place with three points under Nice. Thus, we expect a nice game with two teams called to fight for the title at the end of the year, but where we believe that the balance is a bit in favor of the English, and is that although PSG has been evolving in a good way , It still lacks that strength of previous seasons, so it still costs him to win comfortably, unlike what happens at gunner store, where the Wenger project is still respected, have not changed almost anything to last season’s team that reached the Eighth-finals and then playing at home want to secure the first place; Therefore, because of the value of the odds offered by bookmakers, we believe that the option of No Tie for Arsenal is the best alternative, since in case of equality we are returned the bet. Arsenal: Ospina; Monreal, Koscielny, Mustafi, Jenkinson; Xhaka, Coquelin; Sanchez, Ozil, Walcott; Giroud. PSG: Trapp; Maxwell, Marquinhos, Silva, Aurier; Matuidi, Motta, Verratti; Moura, Cavani, Ben Arfa.